A slow growing large shrub or small multi-stemmed tree. The leaves are long, narrow and irregularly margined, giving the plant a fine texture. Fall color is yellow. Prefers full to half day sun, tolerant of many soils. 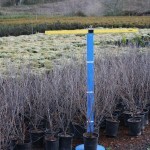 It may be used for shrub borders, screening and as hedging.